OPEN HOUSE, SUNDAY, 4/14, 2-4PM! Amazing Home is Picture Perfect & Move in Ready! Breathtaking Views! 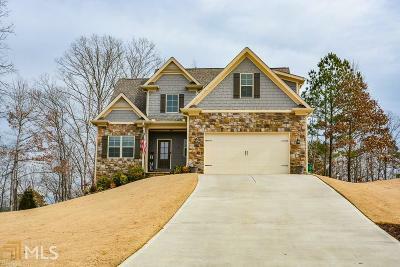 Gorgeous 3BR/2.5 BA, Bonus Room and full basement! Better than new w/Custom Screened Porch, Blinds throughout, Fenced Backyard, Fire Pit, Prof. Landscaping! Wrought Iron Balusters! Hardwood Floors! Custom Molding! Formal DR w/Coffered Ceiling! Chef's kit w/Granite, SS Appliances & Soft-Close Cabinets, Pantry! Laundry Room! Sunny Breakfast Area! Cozy FR w/Fireplace! Desirable Master on Main & Master BA w/Double Vanity, Tile Surround Shower, Clawfoot Tub! Secondary BRs upstairs! Large Bonus Room perfect for Playroom, Office or Media Room! Unfinished Terrace Level! Wooded Lot is .69 acres and sits perfectly on a culdesac lot! Directions: Cartersville Main Street, Highway 41n, Approximately 9 Miles To Lt On Griffin Road, Lt On Law Road And Rt In Griffin Manor S/D To Lt On Cj Court, Rt On Wendover, Rt On Woodlore, Rt On Blanchwood And Rt On Coppage. Home Is In The Culdesac.